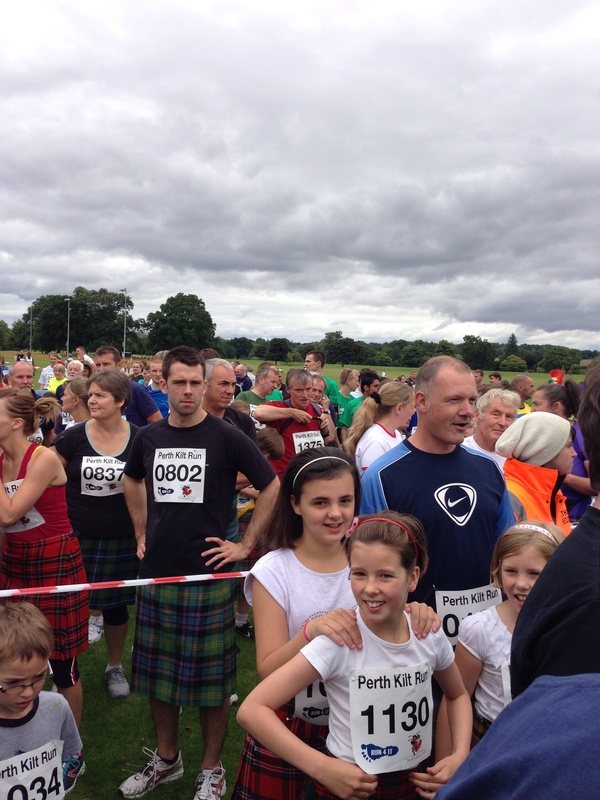 This race was the second Perth Kilt Run, and the reason why all runners work kilts was tartan is just brilliant to try to take the World Record for the highest number of kilted runners participating in a run. You can find out more about this on the website. I was pretty exciting! @TheWelshWookie and I travelled to the parentals the night before this run, to cut out part of the drive, as we live about 2 hours, 20 mins away from Perth. 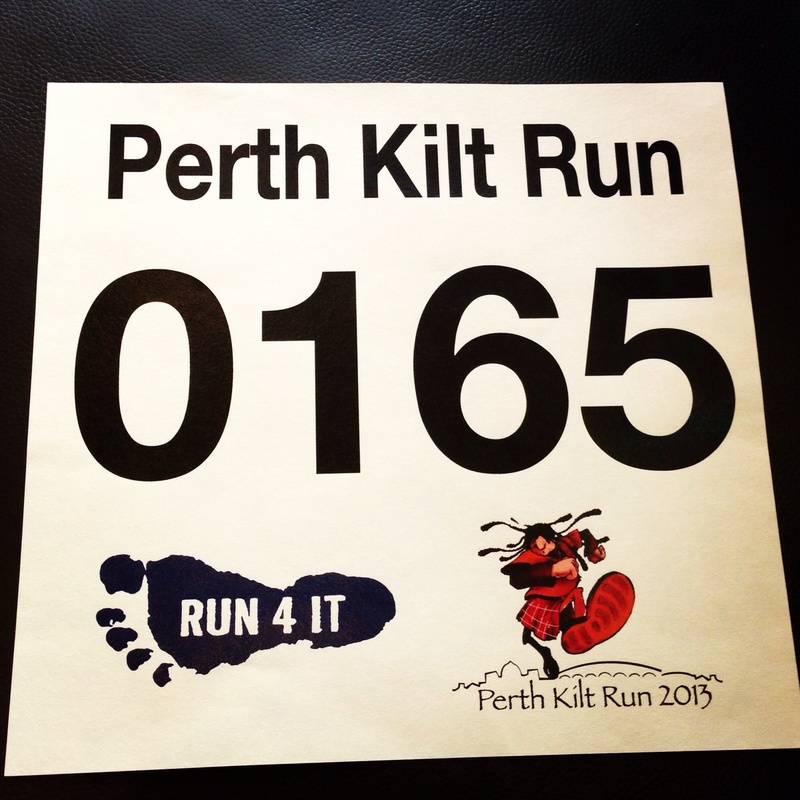 On the morning of the run, we packed up and drove the hour and a half to Perth, in plenty of time to pick up our race packs, and have a short wander around the city before the run. We arranged to meet my bro, sis-in-law and nephew at the pack pick up, which was held in the newly refurbished Bells Sports Centre. As we left super early, we were able to bag a parking space in the car park right at the sports centre. Result! As we arrived at the sports centre, the staff were really friendly, and helpful in ensuring that everyone knew what they had to do, and where they had to go. We collected our bibs and tags, and had time to bag a locker for using later. We then headed into Perth in search of a coffee. I was really impressed with the shops- I think another visit will be on the cards! 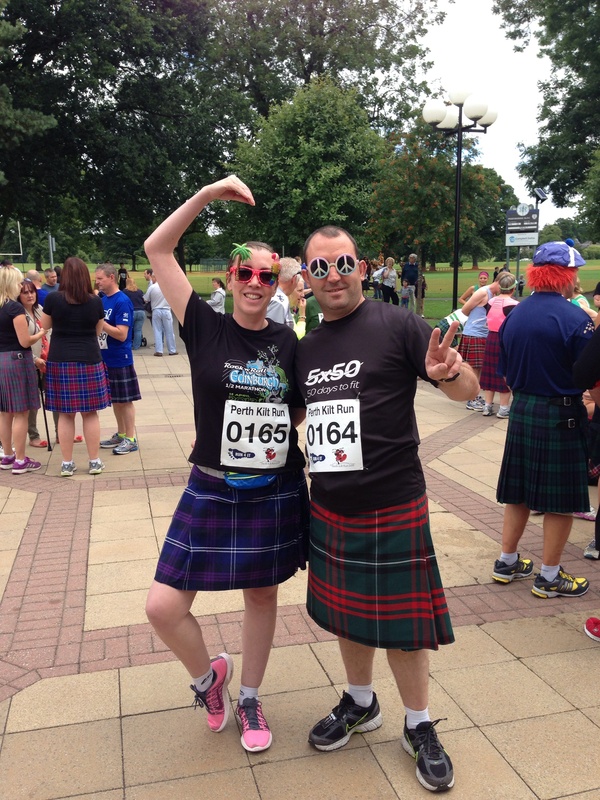 We did get some funny looks, since we were wandering around in trainers and kilts! The race was starting at 1pm, so at around 11.30am @TheWelshWookie and I headed back to the sports centre, and it was certainly much busier than it was earlier! 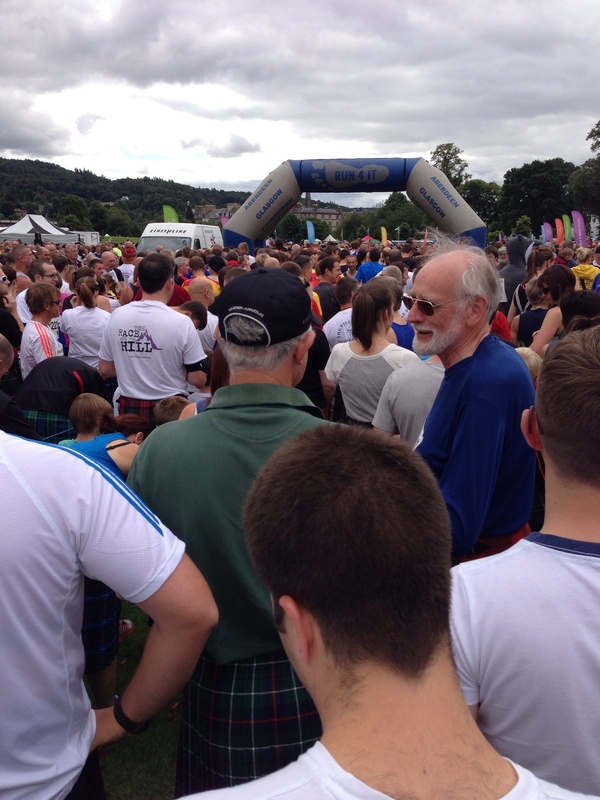 It felt great to be surrounded by so many TartanJoggers! The facilities at the start were great: loads of portaloos, and runners could use the sport centre facilities, which was brilliant. We then met up with the rest of the family, and were were good to go! We made our way over to the starting area, and soaked up the atmosphere. There was the standard pre-race warm up, but we couldn’t see the stage from where we were standing. 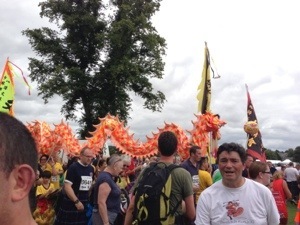 Instead, we watched the Chinese Dragons snake their way towards the start line, along with the pipe band. With about 15 minutes to go, we were advised by the MC to arrange ourselves in the corrals, according to time, with the sub-20s in the first corral, sub-30s in the second one, and so on. Well, that was wishful thinking. The first corral had a lot of families with young kids in it, so I realised pretty quickly that this wasn’t going to go as planned, but that was OK. Today was about taking part, and having fun. I knew that this wouldn’t be a PB run, if I was going to have to dodge small kids, walkers, etc early on 😉 We all entered the second corral, and waited for the start. 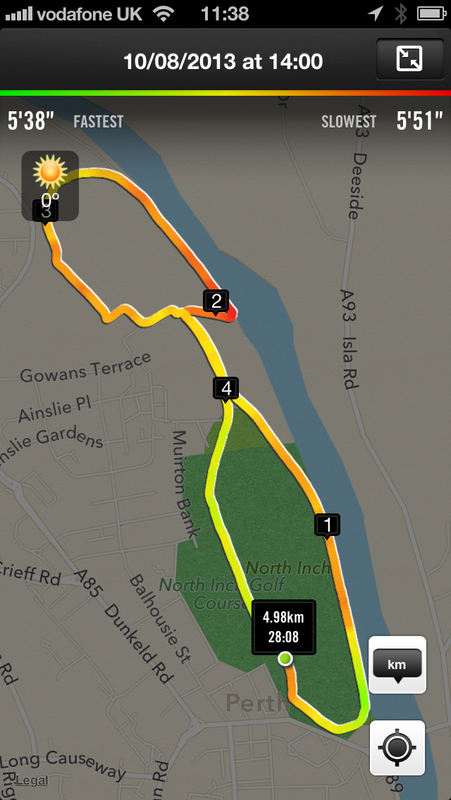 It was pretty much a circular course around North Inch park. The race got off on time, and as the corrals were quite small, we were across the start line quickly. The support was great- with supporters right around the park, which was lovely. The race was along the path that runs around and through the park, with only one small hill mid way. The path was quite narrow in places, which meant that I ran for periods on the grass, to avoid walkers and kids, but there were some parts where this wasn’t possible, so I had to just hang back and wait. @TheWelshWookie and I ran the first two miles together, until his dodgy knee started to play up. My nephew, RJ, was so good that he kept running back and forwards, just keeping in touch- he must have run much more than 5k! The run was lovely- I was pleasantly surprised by all of the sporting facilities around the area, from kiddies play parks to a rugby pitch, tennis courts, petanque area, golf course, bowling green- I think most sports has some facilities available! For the final 1k, the support was great. The added bonus of so many kids running was the extra motivation- lots of parents were encouraging their kid on with shouts of ‘just give it everything you’ve got’ , ‘you’re doing so well’ and ‘we’re almost there’. I’ll happily admit that I benefited from this, too! 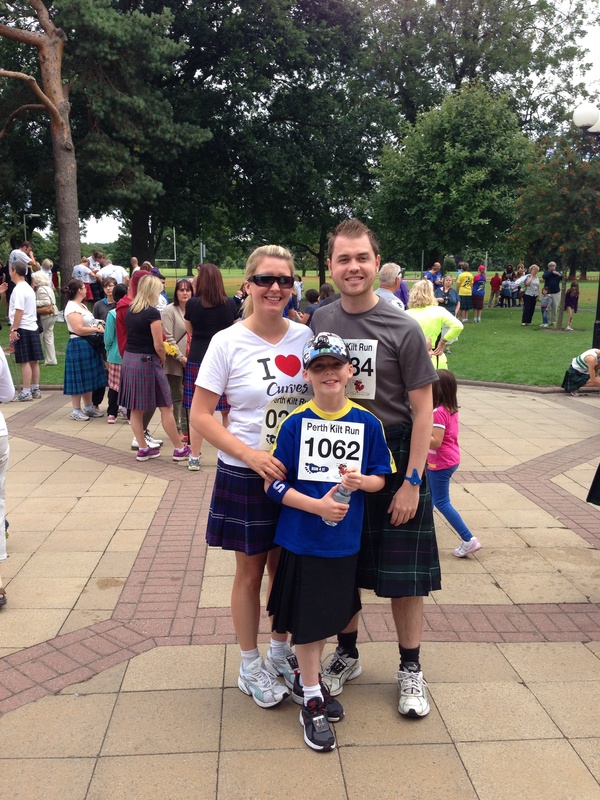 The support across the finish line was brilliant- a young boy completely tore past me in an amazing sprint finish! I almost forgot to de-tag my trainer, and had to go back to do this. I then headed to the marquee, where they were handing out the goody bags, water and bananas. 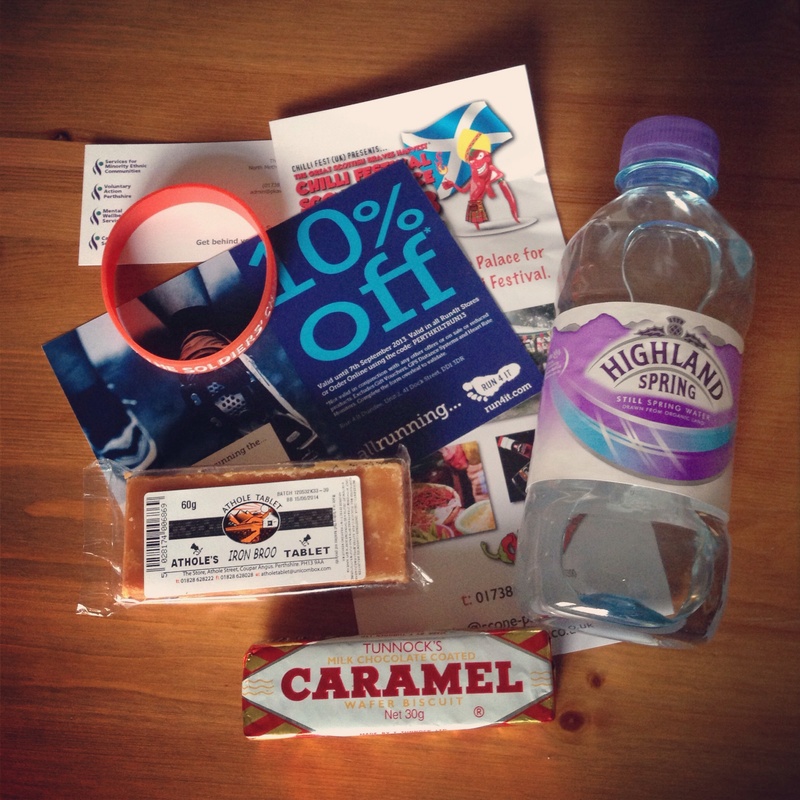 The highlight (and one reason for running) was the Irn Bru flavoured tablet- two of the sweetest things in the world, combined! 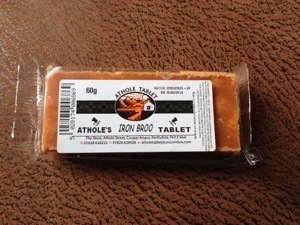 Tablet is like super-sweet fudge, but instead of being chewy, it’s crumbly. Irn Bru is the best selling fizzy drink in Scotland- about the only place in the world where Coca Cola is relegated to second! I collected my medal, and headed back to cheer on the rest of my family across the finish line. My brother Joe was next across the line, followed closely by @TheWelshWookie, Stacey crossed next, after a shoelace failure earlier in her run, and RJ followed close behind, but I reckon he ran about 7k, with his back-and-forwarding! 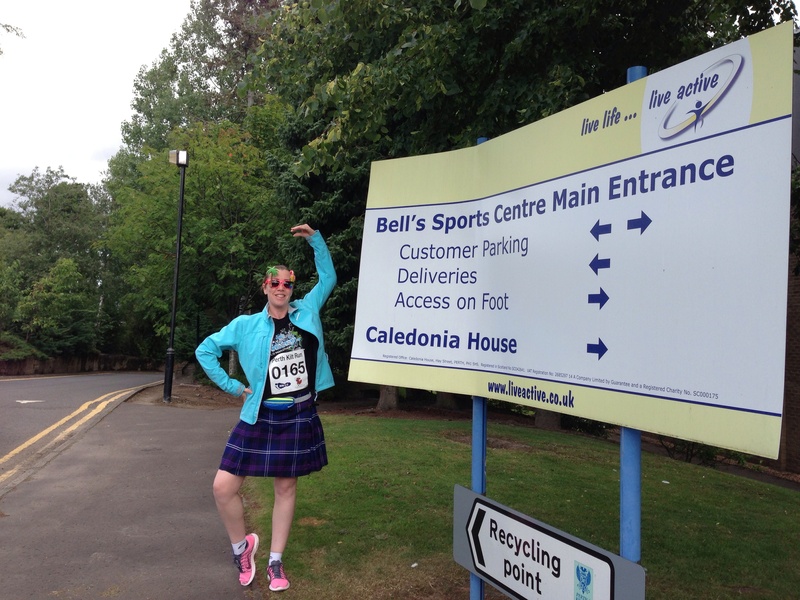 The goodybags had run out, so the staff were doing their best, giving the rest of the runners whatever they had left. 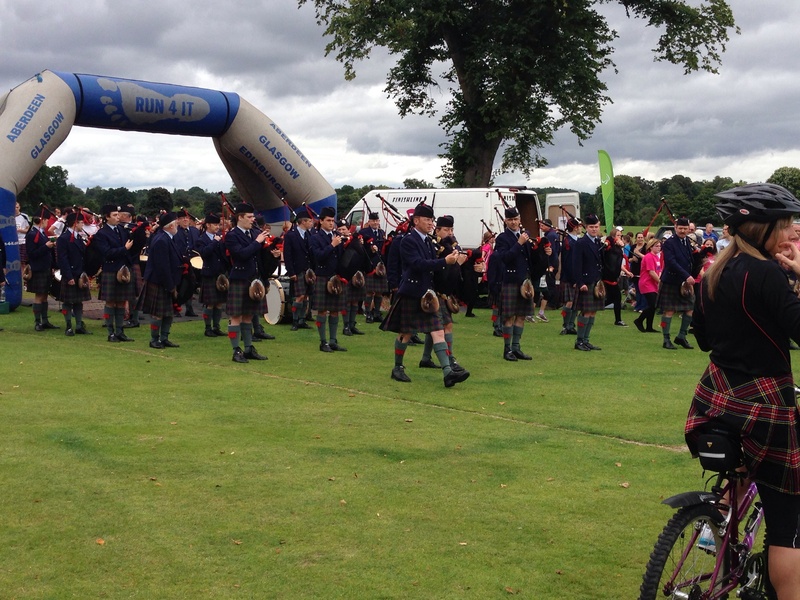 The medals, which had been engraved with ‘Perth Kilt Run 2013’ also ran out, but were replaced with un-engraved ones, so at least everyone received a medal. We headed back to the sports centre, to grab our gear, then wandered back to the activities, for a bite to eat, and to enjoy the entertainment, which was good. 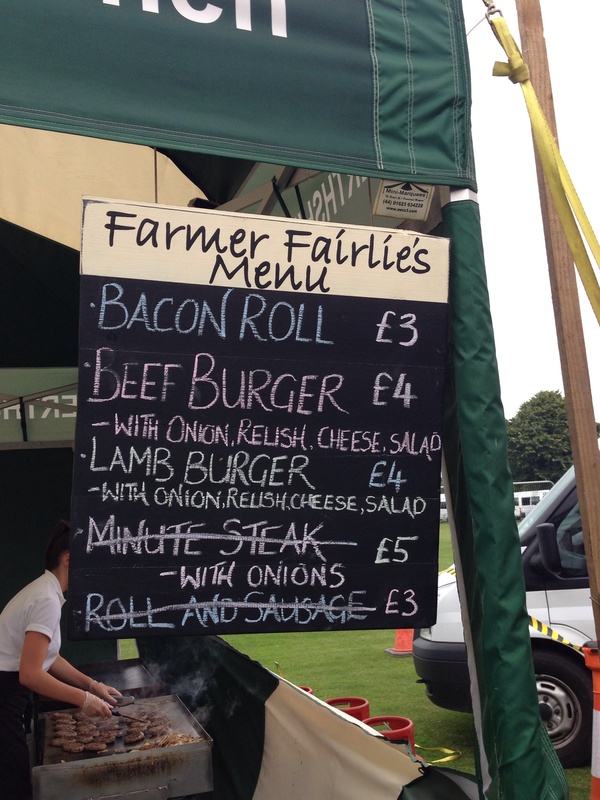 While @TheWelshWookie, Joe,Stacey & RJ enjoyed hot dogs, venison & black pudding pies, and haggis, neeps & tatties, I headed to the marquee of a local farm, which was selling the most amazing burgers! 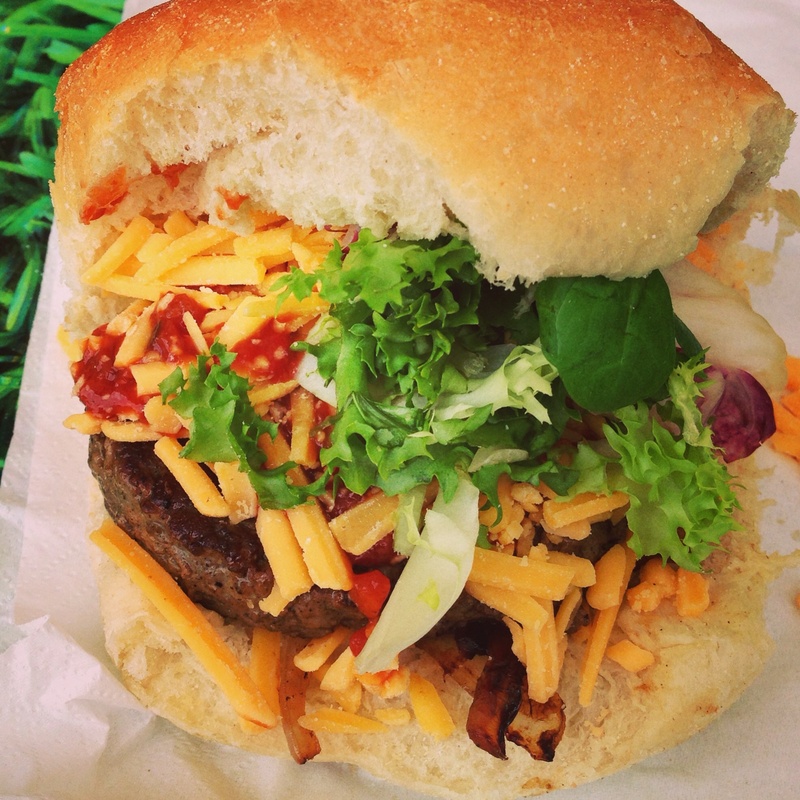 Now, doesn’t that make you feel hungry? It was then time for us to head home 😦 Unfortunately, we had to leave before the Red Hot Chilli Pipers came on stage, which was a shame, as they are fab! As we were heading out, I heard the MC announce that we hadn’t beaten the world record. Boo. BUT, when we arrived home, we saw that this wasn’t the case, and we can now claim to be World Record Holders! Hurrah! Time: 28:06, which I’m pleased with, given the type of run this was. I finished 430th out of over 1,300 runners, and 46th in my category. 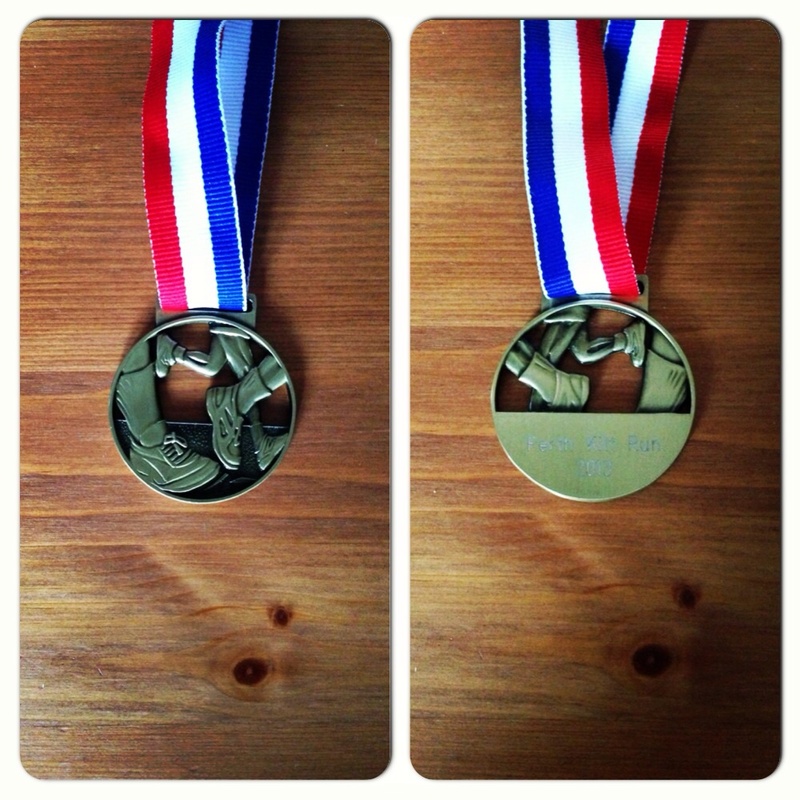 The Medal: Basic, but having it engraved is a lovely touch! This looks like such a fun run! I really want to do something like this, or a colour dash! Great post. I enjoyed reading a different account of the event to see how it compared to my own. Thanks for dropping by! Looking forward to reading your post- it’s good to compare experiences! Hi! Thanks for all of your work putting together such a great event- it was fab! 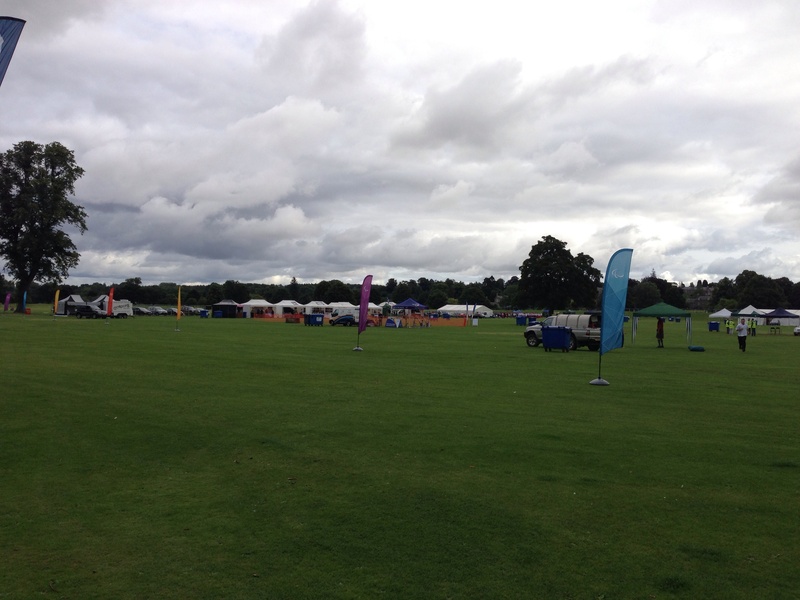 The registration was really slick and well organised, I’m sure that will have helped non-runners enormously! Best of luck with the 10k arrangements, if it goes as smoothly as Saturday, it’ll be a fab event for all participants! I’ll need to add it to my list for next year! Thanks, we got the practice at the weekend. We usually get 300 but we’re nearly at 500 for this year! Our purpose is to inspire everyone to run and take part for their own benefit. How’s your running going? Wow! Double entries? That’s great! I’m on a bit of a ‘running roll’ at the moment- after dabbling for 10 years, I’ve only really started taking it seriously this year and I’m loving it- chasing PBs and tackling different types of races! I have the inaugural Tarbert 10k this Sat, my village run and my third run in 12 days, but this one is hilly and has two trail sections- looking forward to pushing myself! The weather was kind, the atmosphere brilliant, so the tough run went by a little easier than anticipated!